I can't help but get tearful when I see the beautiful face of Richard Martin, the little 8-year-old who lost his life in Boston a couple days ago....a victim of the senseless bombing. I can't make sense of it. Who could possibly do something like this? My heart hurts for these families that lost their loved ones and those that are injured. And of course, just like 9-11, it makes you realize our temporary nature, our frailty and how life as we know it can change in an instant. As of today, we still don't know who did it. No one has taken responsibility for it. There were photos the FBI posted today of two suspects, people are on edge, security is tightened. But there's something else I've noticed too that is heartbreaking. As soon as we heard of the bombings, the posts on Facebook and the internet started. Vicious comments about Muslims, terrorists, nuking other countries, retaliation....I even read about it being a government plot by our president to take the focus off North Korea!!! Seriously? It's all there..and it's incredibly ugly and sad. I understand. We are hurting. We're in pain. We have lost lives...and freedoms. I understand about terrorism and extremists. It is unjustifiable! It is frightening and painful. But filling our hearts with hatred? That is even more frightening and painful. We will then be no better than our perpetrators. I don't really have an answer. But I do know hatred is not the answer. So what can we do? How about being kind to one another. Hugging our children, loving our families, spending more time together and not playing into the hatred. Don't be a party to negative comments/speech especially when it deals with stereotyping. Remember there are more good people in the world than bad. And pray. Pray for peace, patience, and for love to permeate our lives. Pray for lives lost and lives changed because of this tragedy. And pray for an end to this violence. Finally, I wanted to share this. 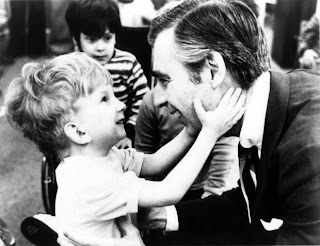 It's something I read from one of my favorite childhood TV personalities, Mr. Rogers. Such a beautiful sentiment that was carried through childhood into adulthood. We need to all look for the helpers....and better yet, become the helpers.